<!-noindex-> HIE | Does Rising Carbon Dioxide Cause Australian Forests To Grow More Leaves? New research published in Global Change Biology sheds new light on the complex changes brought about by elevated CO2 on the leaf area and canopy dynamics of Australian woodland at the EucFACE Experiment. As atmospheric carbon dioxide levels continue to rise, researchers across the world have developed ecosystem models to predict how forests will respond to the extra CO2 in the air. 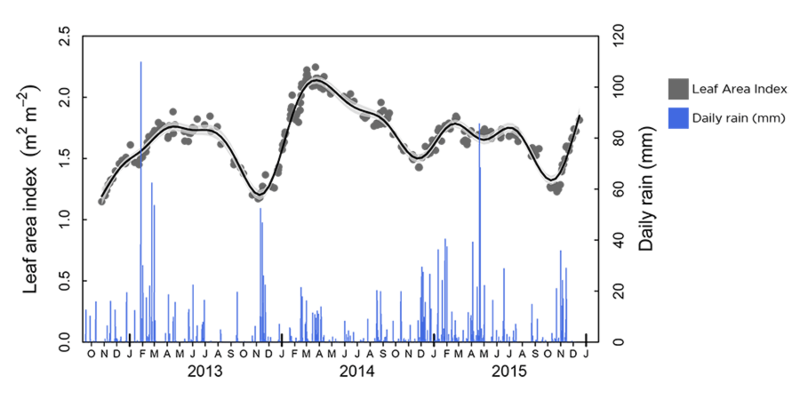 These models generally predict that plants will take advantage of the extra CO2 and grow more leaves, which itself is an important element of the feedback response to climatic change in forests. 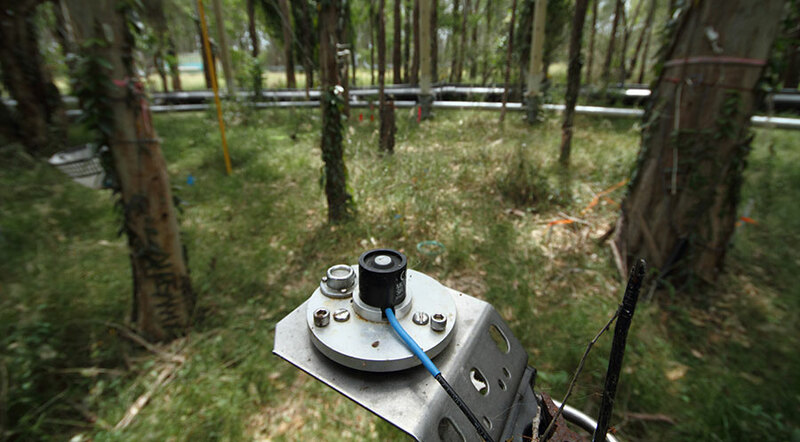 Measurements from the EucFACE experiment have shown that the leaf area of the canopy does not respond to the additional CO2, but strongly tracks the availability of water. This finding provides an important insight into the responses of Australia's unique forests to elevated CO2 and contrasts early predictions that extra CO2 would result in more leaves. Australia's eucalypt-dominated forests are often water-limited and this study clearly shows that the trees are strongly responsive to the cycling of wet and dry periods. Following heavy rainfall, the trees often respond quickly to produce new leaves and as the soil dries, the trees act to conserve water by progressively shedding leaves, which produces a leaf area pattern that is consistent with water availability. "The leaf area of the canopy is a measure of the tree's ability to draw carbon down out of the air and leaf area strongly influences a wide range of ecosystem functions in the trees and understorey', explains Dr Remko Duursma, senior lecturer in ecosystem modelling at the Hawkesbury Institute for the Environment. "The findings that leaf area is not responsive to elevated CO2 is consistent with other forest Free Air CO2 Enrichment studies but contrasts the increase in leaf area that is predicted by many ecosystem models. This is why it is so important to test responses in real-world conditions like EucFACE to inform modelling and predictions at a larger scale. These studies provide accurate data within the natural variability of Australian forest ecosystems where very wet and very dry conditions can occur close together." These findings are clearly supportive of the need to maintain forest prediction experiments in Australian conditions, which are markedly different from ecosystems that have been subjected to FACE experimentation overseas. These findings are based on observations made over 28 months and to gain a full understanding of the impacts of elevated CO2 in combination with natural moisture cycles, high and low temperature events and natural tree growth patterns. With 160 million hectares of native forest, Australia's Direct Action policies to mitigate rising CO2 are heavily dependent on the ability of trees to draw down carbon from the air. These findings shed new light on the impacts of rising CO2, and indicate that emissions reduction schemes need to be fully considerate of water availability and temperature factors in tree productivity for the policy to achieve its aims. Under elevated CO2 conditions, the area of leaf in the forest canopy is directly associated with water availability. The additional carbon in their air does not alter the leaf area. Publication: Duursma, R. A., Gimeno, T. E., Boer, M. M., Crous, K. Y., Tjoelker, M. G. and Ellsworth, D. S. (2015), Canopy leaf area of a mature evergreen Eucalyptus woodland does not respond to elevated atmospheric [CO2] but tracks water availability (opens in a new window). Glob Change Biol. Accepted Author Manuscript. doi:10.1111/gcb.13151.